Okay, under normal circumstances, I don't work on anything except 1968 Shelbys. 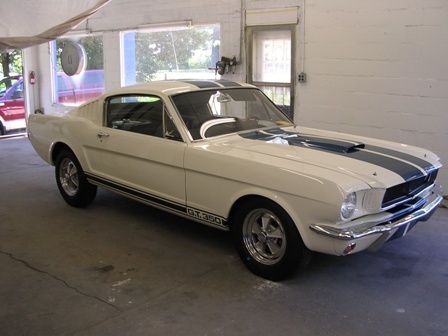 Getting a chance to work on an original GT350 is certainly not a chance you get very often. That combined with the fact, the owner was a good friend and a former customer convinced me. 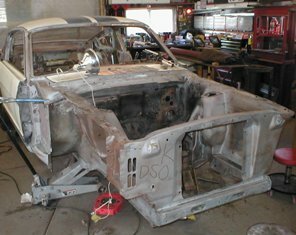 I hope to give you some ideas of what the restoration of a car involves. Hopefully, you can get an idea of the time and effort involved in a major project such as this. The owner spent considerable time and effort in finding this rare, classic car. Networking was the key element in the owner acquiring this car. I have discussed buying a car on the website. The car also had to be transported to my shop in Wisconsin from the previous owner's residence in Iowa. So, in addition to the purchase price of the vehicle, transportation costs should be factored into your budget. 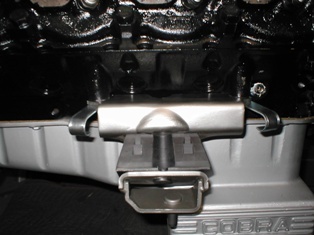 The Shelby serial number SFM5S337 is affixed to the driver's side inner fender apron. 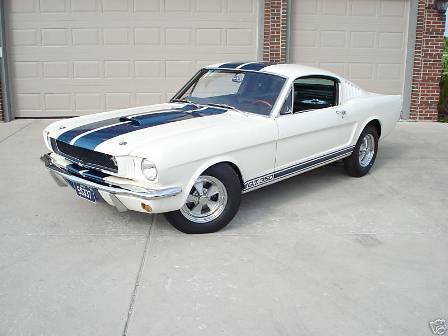 It denotes the a 1965 "street" model GT350. Shelby American also built a few "competition" cars, commonly called "R-models". 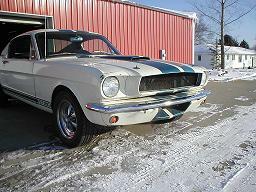 According to the 1987 Shelby American World Registry only 562 cars were built in 1965. Once I received the car, the first step is to check the authenticity of the automobile. I inspected the Shelby tag. 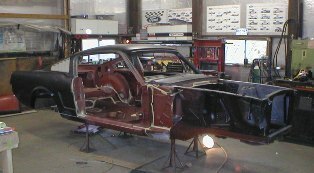 I removed both front fenders and verified the Ford serial numbers with the Shelby American Automobile Club. The 1965 Registrar, Howard Pardee, confirmed the numbers were correct. He also indicated the Club had some original paperwork for the car. 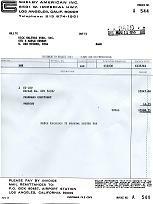 I requested and received copies of the original shipping documents and warranty work done on the car. These items, along with the paperwork received when the car was purchased, were placed into a three ring binder. This information matches the car. The current owner purchased the car from Gerald Schacht. Until recently, the car still had both sets of traction bars and the R-model apron. Schacht stated the car had been stored since the 1970s. 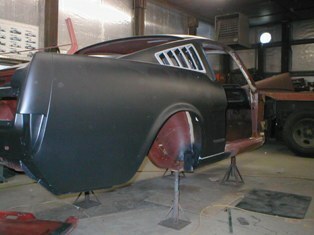 The 1965 is at the body shop getting the attention it needs and "stage 1" is nearly complete. Stage 1 involved the documentation and disassembly of the car. It took 38 hours to take the car completely apart. When I say "completely", I mean completely. Nothing could off the unibody when I was finished. I found the 1965 to be rather simple to disassemble. Everything came apart pretty easily. The rear leaf springs were a bit challenging. 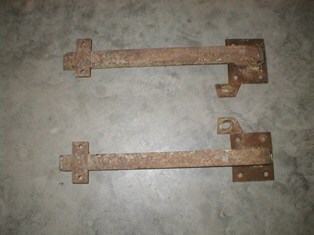 I also left two broken bolts for the bodyman to address. In this picture I have highlighted some original firewall handwriting. I continue to document the car and started building a book. The book will contain all the factory paperwork (or in this case copies) and owner information. This information includes old pictures, titles, applications for titles, etc. I did find a interesting document inside the car. It was a traffic citation from 1973. The ticket was issued Richard Thompson of Newton, Iowa. That is consistent with the Iowa history of the car. The ticket was issued for "improper muffler". The fine was ten dollars. Interestingly enough, 1965 Shelbys do not have mufflers? Hmm, I would have like to see Richard explain that one. I also found a small piece of the original trunk mat. 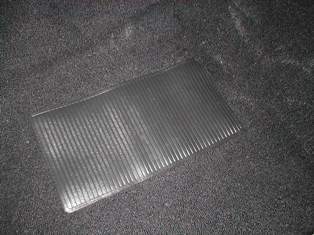 That was nice because I could now confirm the car originally had a rubber, plaid trunk mat. I also noted more than a few paint identification marks along the way. I consulted with a well known Mustang Club of America judge. He shared many of his detailing pictures with me. I have decided not to copy any paint identification markings from other cars, but only recreate the marks I find on this particular chassis. The pictures did show me where to look on the Shelby. I am certain, I would have missed several markings without the information from the judge. Some of the markings were quite clear and obvious. 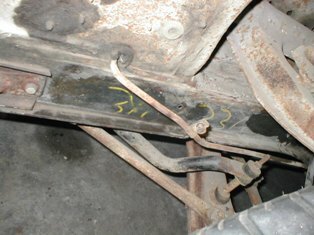 These pictures show the handwriting on the driver's frame rail . These color codes were found on the rear springs. One yellow dot and one green dot on each spring. All the color codes were documented with digital photos and placed on a compact disc for the owner. 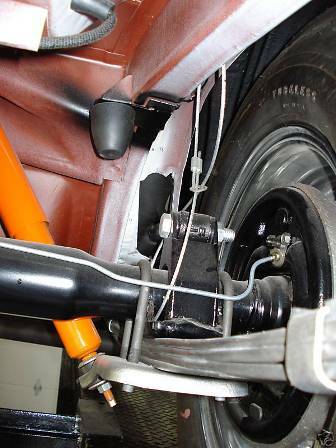 I also found the upper and lower traction bars still in place on the car. I do not believe the lower bars were a factory installation. They were most likely added by one of the previous owners. Luckily, they were a bolt on application. Previous owner's are notorious for making non-stock modifications to cars. These modifications usually involve things like cutting sheet metal with a dull butter knife, using a bolt cutter to make wiring modifications and installing purple fur. Luckily 5S337 survived with very few modifications. It did have a factory radio installed, but that is easy enough to fix. The dash was not cut. 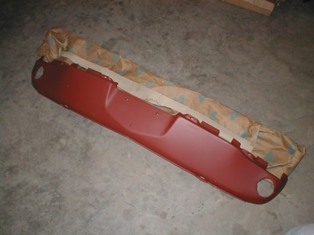 I found this beautiful NOS front valence to replace the fiberglass, aftermarket R-model valence on the car. I think it was the first time it was out of the wrapper. JULY UPDATE: The cleaning and refurbishing of parts is underway. As I mentioned before, the restoration is labor intense. Here are just a few of the parts that have been cleaned up already. 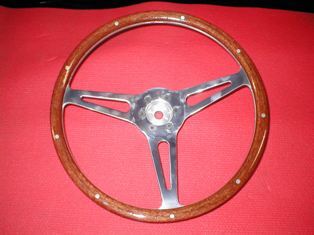 The original steering wheel had been replaced with a 1967 wheel. 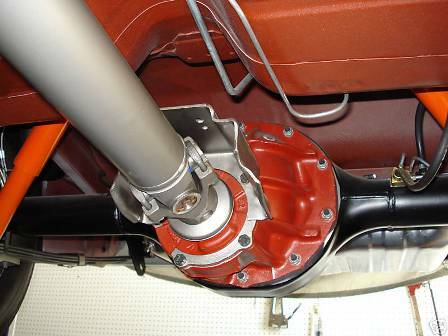 The wheel was sent to a happy 67 Shelby owner and I replaced it with a 1965 version. 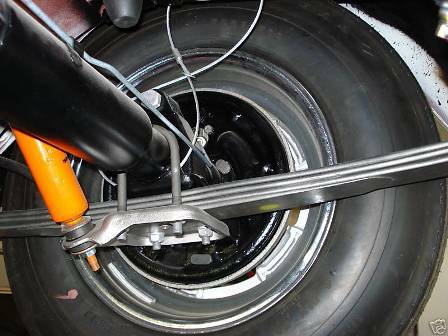 This wheel is still made by Moto Lita the original supplier. These pins are actually NOS parts. In many cases, replacing chrome is cheaper than refurbishing it. These are different from the reproductions. The originals had a little surface rust and the price was very reasonable. An owner was keeping them as spares. I don't want to give you the impression everything gets replaced. This car will retain many of its original parts. This spindle came off the car. 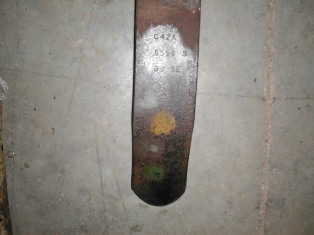 The original part was cleaned, media blasted and sprayed with a cast iron paint. The darker top coat mimics the coating. The original orange and pink marks were copied exactly. The disc brake caliper retainer was also cleaned. The bolts were re-phosphated and the nuts were replated. This is a good example of why you should not copy marks from other cars. This red daub on the spindle stop was not visible on both sides. So, I only recreated it on this one. A careful reading of the assembly manual indicates it was only on one side originally. It would have been very easy to transpose the mark to both stops. 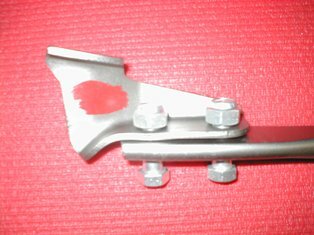 The strut has been cleaned and sprayed natural, bolts are replated silver cadmium. The heater box cleaned up very nicely. I always refinish the original case rather than paint it. I won't reveal the process, but this case looks like new. New seals and a new heater core also wait to be installed. 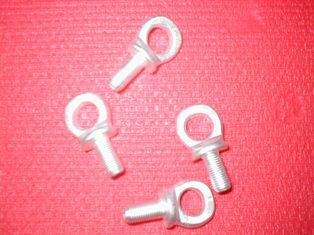 These are the anchor eye bolts for the seat belts. The original seat belts were so nice, they will get a gentle cleaning and be reinstalled. 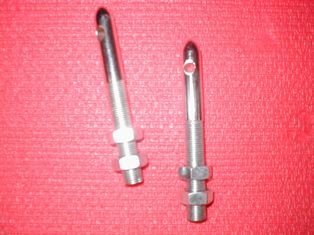 The anchors got glass beaded, wire brushed and replated. They could easily pass for NOS. OCTOBER UPDATE : After spending summer vacation in the bodyshop 5S337 finally nears a finish painting. 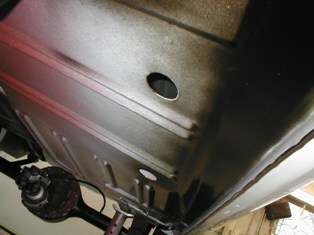 The black primer is used to make sure the panels are perfectly straight. You can see the seam sealers (white lines) have been added back to the body. These photos were taken just days before the final primer was shot. 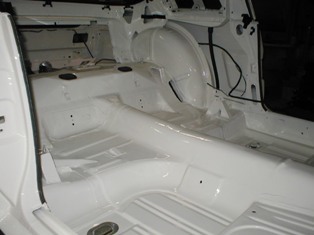 On this day, the fenders and doors were re-fitted to the body to get everything aligned. 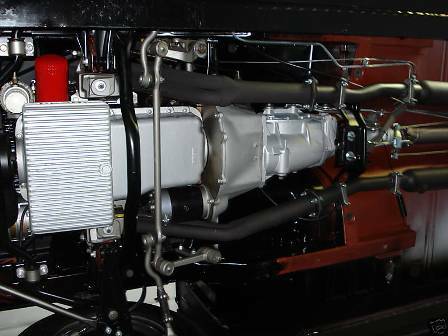 It is hard to believe that the process of refurbishing the body and parts is almost complete. The third stage (reassembly) is ready to begin. We have certainly passed the halfway point of the restoration. I still don't have a firm grasp on the number of hours the body shop has spent massaging the old unibody. But, I can tell you it is approaching 500 hours. Hopefully, with the finished paint, we are under that figure. The owners of this car really have not spared much expense. With the current prices of restored 1965 Shelbys, they are merely enhancing their investment. I hope to have some better time estimates in the next update. A quick recap of what's finished may be in order- I have finished up the suspension parts and they are ready for the chassis. I have been looking at parts and addressing each item one at a time. On the interior, a custom made carpet will replace the tired original. The original carpet has no toe pad. It was custom ordered from the original manufacturer. Hopefully, the person you have restore your car has relationships with good vendors and manufacturers, to get the parts you need. 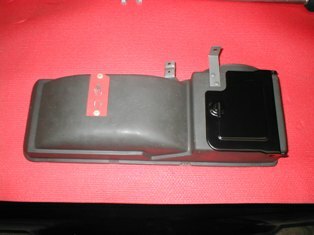 Interestingly, 5S337 had a rear package tray that was also carpeted. This carpet was saved, but won't be reinstalled. Consultation with the Shelby Club revealed it is unlikely it came from the factory. The seats were so nice, they will just get a gentle cleaning. 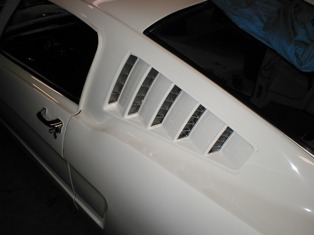 I was able to order new back boards from a Mustang vendor to replace the damaged originals. It is nice when the original upholstery can be saved. I love NOS (new-old-stock) parts. 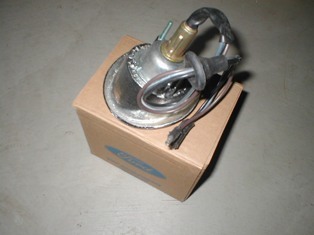 In some cases it is actually cheaper to replace a part than refurbish an old part. The bumper guards are a good example. Rechroming originals would be expensive. 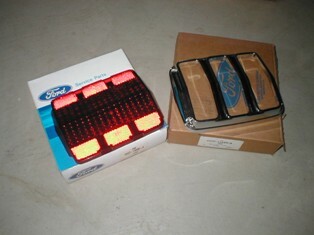 Here two new parts will come right from FORD boxes to replace the missing front parts. Fresh, new lenses always look good on a restored car. On a high dollar car, you want to use as many original Ford parts as you can find. In some cases, original NOS parts are just nice to have. 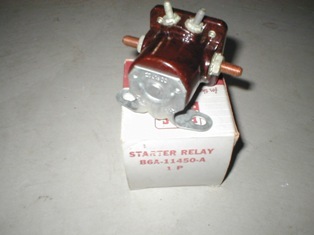 Here is a great example, this NOS starter relay is super RARE. The reddish brown part is nearly obtainable. Most reproductions are black. This one came from Jim Cowles at Shelby Parts in Green Bay, Wisconsin. Most concours show cars don't even have one of these! I plan on doing a feature article regarding the different types of parts in the future. JANUARY UPDATE : Back and reassembly is well underway. The floors turned out absolutely spectacular. If it were up to me, I would leave the carpets out. You can see I have already reinstalled all the brackets for the interior panels and some wiring. 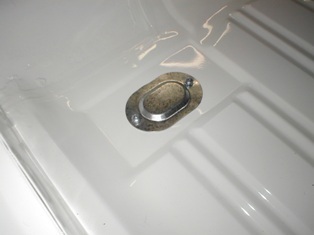 The floor plan drain plugs are left bare. They should be installed after the car is painted. 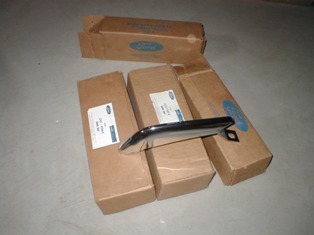 The 1965 covers have a different shape than the 1968 covers used in the New Jersey plant. 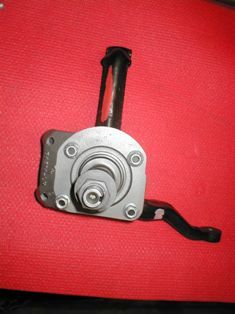 My understanding is the Hi-po motor mounts are unique. I cleaned them thoroughly and used a reproduction insulator. After 40 years the old rubber insulators are ready for retirement. 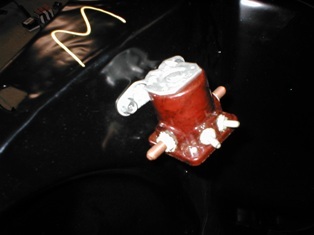 The last thing you want to do is pull out the motor because of a broken insulator. It is a great feeling to get the motor back in the car. 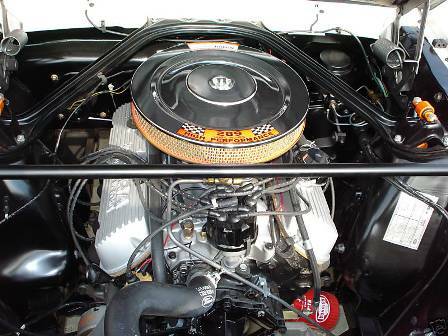 Here is the 289 Hi-po going in the engine bay. After doing several 428 Cobra Jets, the little 289 was a breeze. Here's the NOS solenoid in its new home. The yellow "3" was found on the inner apron during teardown. It's April! The car is not finished....but it is coming along very nicely. It will be done for the June update without question. I relearned setting arbitrary dates is never a good idea. I actually decided to take about two weeks off when things in the shop started going south. Call it what you like, but a little vacation to recharge your batteries is always good idea. Every project has a saturation point. Somewhere during the project you just get sick of fighting all the details. When that happens you have a couple of options....take a break or start making compromises. I don't even have any good pictures of the progress so far. The last of the big body parts are going on the car now. The vents turned out great. Putting the door glass is one of last big projects. The owner has decided to put the racing stripes on the car, so that is on the list as well. I am working on the final list of things to be done. 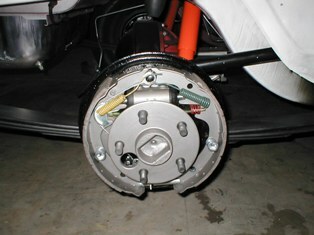 The GT350 used the big brakes in the back. This being the first 1965 I have done, I learned the smaller brake kit will not interchange when using the larger brake pads. It seems like every time you get rolling, you need some small parts to finish the task at hand. 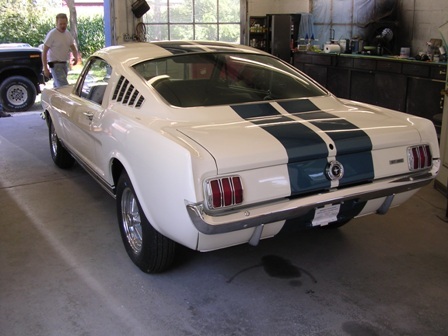 It has been 42 years since the plain, white fastback left the Los Angeles airport. It has been nearly 18 months since the car first came to my shop. The restoration went very well. I learned a lot about 1965 Shelbys. Sometimes it seems like every part is a struggle, every nut and bolt, another challenge to be resolved. The simplest of tasks become projects that take way more time than previously expected. After the car is assembled you have to make all the parts work together. If you are still wondering why the process is so expensive think about all those parts that were changed along the way.....new brakes...rebuilt transmission....rebuilt engine....new suspension....all needing to work together. 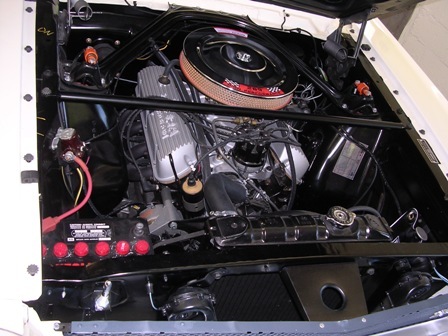 The total restoration costs included some 750 hours to refresh the tired body, lay down some new paint and stripes, repair the broken and battered original hood and polish the car to a brilliant jewel like finish. Additionally, approximately 250 hours was spent on research, cleaning all the small parts, refinishing them and reinstalling them back on the car. New replacement parts totaled somewhere in the neighborhood of $25,000. That of course is a hefty bill. 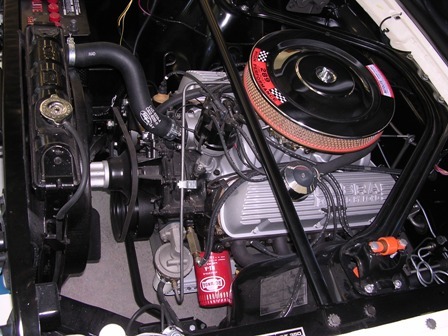 But, remember most parts were Ford original parts (NOS parts). When you are building a car that is worth more than most peoples homes, you can't do it on the cheap. 5S337 made a good showing at the Shelby Club's 34th annual convention. The car won a Bronze Award in the concours competition.